Panasonic has a new compact, interchangeable lens Micro Four Thirds camera, the GF3. The Panasonic Lumix GF3 gets many of the features introduced a few weeks ago in the G3 (Panasonic Lumix G3 announcement) but in a smaller package and with a lower resolution 12-megapixel sensor. As far as basic specs, it’s very similar to its predecessor, the GF2. It has 1920 x 1080 60i AVCHD video, a 3-inch touch screen LCD display and a built-in pop-up flash. However, it’s been redesigned to be even smaller than the GF2, it has improved auto focus performance, better battery life and it can capture 3D still photos. The key differences between the Panasonic GF2 and the new GF3 are the new smaller, rounded body and the improved auto focus performance. 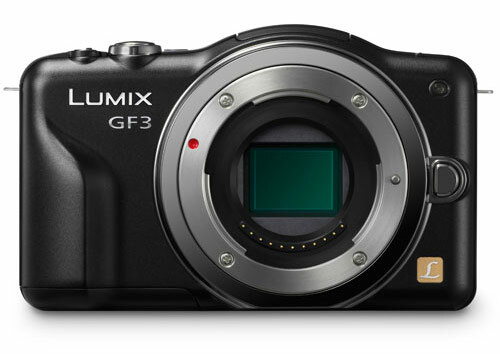 The GF3 is Panasonic’s smallest interchangeable lens camera with a built-in flash. The press release says the size is, “comparable to that of a smartphone and weighing just 7.83oz (body only), less than a standard 8oz cup of coffee.” At 4.24 x 2.64 x 1.28 inches, it’s not small enough for a pants pocket with a lens mounted, but it’s small enough for a coat pocket and it’s an awesome size for a travel camera. “Light Speed AF,” was introduced with the Panasonic GH2 and doubles the frame rate of the auto focus sensor to achieve a minimum auto focus reaction time (shutter lag) of 0.1 seconds. Via the touch screen controls, the GF3 has, ” Pinpoint AF,” which allows you to select almost anywhere on the LCD as a focus point. A year ago I was skeptical of touch screen controls but I’m starting to come around. I’ve been using the touch screen auto focus controls on the Panasonic Lumix ZS10 pocket superzoom and they’re pretty effective. I don’t use them for every photo but I sure like having them as an option. The Panasonic Lumix GF2 will be available in July in a kit with a 14mm prime lens for $699. In August it will be available with the standard 14-42mm kit lens for $599. There will be four color options: black, white, red and brown.